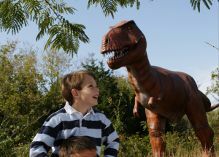 Visit over 100 life size dinosaurs in an outdoor museum. Take a paved walk through the Texas hill country and lean about these prehistoric creatures. 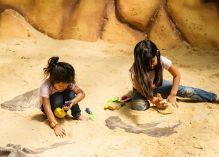 Sift through sand at the Fossil Dig and find authentic fossils to take home. 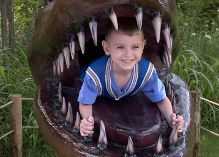 Visit the all new Dino Gem Excavation and pan for real minerals and gems! Unearth a life size dinosaur skeleton in the Boneyard. See fossils and skeletons in the Prehistoric Museum.